Getting to the truth can be a difficult task for managers. People sometimes withhold, spin, or slant reports, especially when the implications are uncomfortable or threatening. A culture that supports truth telling can be an organization's most valuable asset. That last sentence brought silence to the room, partly because of the darkness of the news, and partly as an honor to Jack for having been brave enough to have reported it with Eileen sitting right there. As if in anticipation of an explosion, everyone turned to look at Eileen. 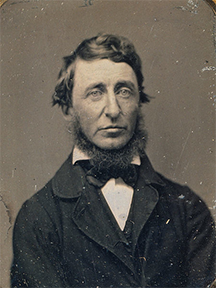 Henry David Thoreau in 1856. Photo of a daguerreotype by Benjamin D. Maxham, available at the U.S. U.S. National Portrait Gallery. "First I want to commend you, Jack, for telling us so early, while we still have options," Eileen began. "Takes courage. And what do you think we ought to do now?" Eileen has just taken two steps that will encourage people in her organization to report the truth. She has publicly recognized Jack for telling the truth, and she has rewarded him by asking for his guidance in responding to its implications. Samuel Goldwyn once said, "I don't want any yes-men around me. Tell me the truth, even if it costs you your job." The laughable impossibility of his preference is at the core of the problem of getting to the truth. Punishing truth telling drives Truth underground. What actions can you take to encourage people in your organization to tell the Truth? Telling the truth can entail revealing failure. If you punish failure, or even if you recognize only success, you train people to conceal failure. Recognize people who take reasonable risks, even if they aren't successful. Recognize failures — not all failures, but at least those that result in valuable learning. Some tactics that managers use are coercive. By creating a sense of powerlessness, coercive tactics can erode the sense of safety so essential to truth telling. Avoid killing the messenger, cold-shouldering the messenger, and blaming individuals for group failures. One great illusion about layoffs is our denial of their long-term costs — they reduce our sense of security. The certainty that someday layoffs will happen again can cause many to withhold, spin, or varnish the truth. Reduce staff as a true last resort — after spending cuts, after reducing management compensation, and after reducing employee compensation. In some organizational cultures, withholding truth is seen as loyalty. People who disclose bad news are sometimes seen as "ratting" on peers. Train people in disclosure. Encourage people to support each other in uncomfortable disclosure by sharing responsibility. Group responsibility makes truth telling easier. Would you like to see your comments posted here? rbrenOAEsLQVoNnvduHJEner@ChacruPpHmjvCWzKAMFMoCanyon.comSend me your comments by email, or by Web form. We spend a lot of time and emotional energy in meetings, much of it engaged in any of dozens of ritualized games. Here's Part IV of a little catalog of some of our favorites, and what we could do about them. To manage well, we need to know where we are, where we would like to be, and what we need to do to get there. Measurement can help us achieve our goals, by telling us where we are and how much progress we're making. But some things aren't measurable, and some measurement methods yield misleading results. How can we use measurement effectively? Among the factors that determine the influence of contributions in meetings are the content of the contribution and how it fits into the conversation. Most of the time, we focus too much on content and not enough on fit. Nearly everyone hates meetings. The main complaint: they're mostly a waste of time. The main cause: us. Here's a field manual for people who want to waste even more time. It's widely believed that managers delegate some of their own authority and responsibility to their subordinates, who then use that authority and responsibility to get their work done. That view is unfortunate. It breeds micromanagers. See also Personal, Team, and Organizational Effectiveness and Effective Communication at Work for more related articles. I offer email and telephone coaching at both corporate and individual rates. Contact Rick for details at rbrenYpHNTptqnYzTAGdGner@ChacKDGsumoYbfWlJoxPoCanyon.com or (650) 787-6475, or toll-free in the continental US at (866) 378-5470. More articles about person-to-person communication!